When things start going wrong with the telescopes at McDonald, there is a team of engineers that work to keep the machinery â€” some of it decades old â€” running smoothly so astronomers can continue to get their data. The head of the observing support team, Earl Green, is in charge of three areas: computing, instruments and optics, and electronics. He helps to track and fix mechanical, coding, and wiring problems with the telescopes. And, to top it all off, he sometimes works at the Visitors Center. "I'm a jack of all trades here at McDonald," Earl said. When Earl isn't fixing telescopes, he is working on the house he and his wife are building in Limpia Crossing, Texas. But this is no ordinary house. He and his wife have been working for more than 14 years to build an "Earthship"-style split-level house constructed mainly from old tires and dirt. "This has literally been built from the ground up," Earl said. "It's like building a house out of doughnuts. Well, 2,200 heavy, rubber, dirt-filled doughnuts." Earl and his wife salvaged tires from neighboring ranches and junkyards, filled them with dirt, and used them as the "bricks" to build the walls. Then, another layer of dirt was added to the outside, making the outside of the house looks similar to an adobe with dirt walls. "It's building something useful, one of the most useful things in the world, actually, out of, essentially, trash," Earl said. "Plus, the walls are 36 inches thick. You can't get insulation like that in just any house." Though the house is now livable, Earl says the living conditions would be "marginal" at best. He and his wife live in a different house nearby, but hope to move into their creation in "a couple more years." When Earl isn't filling tires with dirt, he and his wife like to frequent dog shows to show off their purebred saluki dogs. They have had as many as six at one time, though they only have two now: Kis and Tinkerbell. "The house has been our first priority for a while," Earl said. "But soon we hope to get back into the dog showing circuit." Earl and his wife also love traveling and Japanese food. "When I was in the Air Force, we were stationed for three years in Tokyo, and we fell in love with the place," Earl said. "We would bicycle to shrines, take trips on the local trains. Most of my colleagues went to work, and then went to the American bar to drink, and so they hated Japan. We loved it because we really experienced it." When Earl was stationed with the Air Force in Boston, he took a lot of business trips to Germany to work on radar projects. "I spent a lot of time in what was then West Berlin," Earl said. 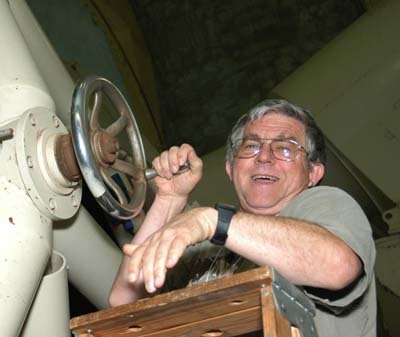 "Now, recently, I went back to Munich, Germany, to help with a factory acceptance test for the MONET Telescope project. So it's funny how your life goes full circle."